First, a disclosure: I am not an athlete, nor have I played one on TV. I can (sort of) skate, but I’ve barely played hockey. Despite all that, I’ve decided to become a goaltender… at 40. Why? There’s something about it I just can’t shake that’s finally become irresistible. I’m not sure exactly what that something is, but I’m going to find out the hard way: diving head first. I hope you (soon to be!) fellow beer leaguers have as much fun reading about it as I’m going to have doing it. I’ve always liked sports – at least conceptually – but more often than not, my enthusiasm vastly outstripped my skill. I’ve been gym-class hero exactly once in my life. Ironically enough, it was playing floor hockey in eighth grade. I looked like pre-injury Chris Pronger out there; the fact that I was a transfer student and hated most of the kids in my class probably didn’t hurt matters any. 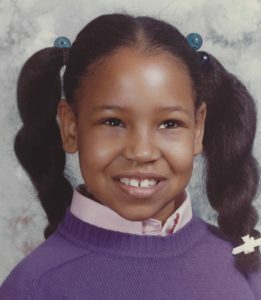 But I was a little black girl, and this was northwest  Detroit in the early 80s. There were no magical frozen creeks, no ponds, and I hadn’t even heard of a backyard rink! In the world I knew, hockey was a foreign concept, that mysterious thing white guys did on the super-snowy CBC channel. No one I knew played, or even watched. My dad, the only legitimate athlete in the family, ate slept and breathed golf now that his semi-pro football days – at my mom’s insistence – were behind him. Winter was merely time to get ready for spring. I took figure skating lessons at a nearby arena when I was about 9 or 10. The hockey boys who shared the ice with us were wild and rough; their sudden, dramatic, snow-spraying stops terrified me (granted, that didn’t take much). All I wanted was to avoid them at all costs and figure out how to skate backwards. I succeeded at only one of those. Things changed my senior year of high school. By that point, I’d been surrounded by passionate hockey fans for three years, and curiosity finally got the best of me. I had to find out what all the fuss and bother was about. 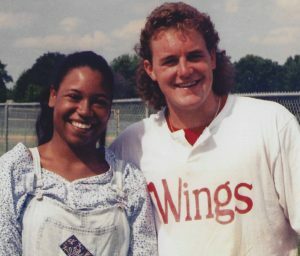 My best school-friend at the time volunteered to lead me out of my ignorance and taught me the broad history of the NHL while simultaneously guiding me through the 1993-1994 Red Wings season. By the time we saw baby-faced Chris Osgood break down in tears following that brutal misplay against the Sharks, I was head-over-heels in love with this exotic game, and with the goalies most of all. Yes, that’s me with a young Darren McCarthy in 1994. Except Patrick Roy. Nobody here in Wings Country liked that guy. Nobody. Now fast forward 23 years. I looked around one day late last year, and suddenly realized that all the pieces had gathered into a tidy pile at my feet. The horrific asthma that I’d suddenly developed at 15 – and that very nearly killed me at 24 – was under solid control. I had my own transportation. I had something that vaguely resembled a “real” job, so I had a bit of discretionary income. I had no children, no spouse, no relationships, and no social entanglements, so I had time. And I’d just turned 40. So I did what every reasonable, newly-middle-aged woman does: I decided I was finally going to learn to play hockey. I signed up for skating lessons, and tried to convince myself that playing defense would be good enough for me. My gym was weirdly awash in elite goalies; in addition to being old enough to be their mother, I’d seen them work, and I was absolutely not on their level. I couldn’t even find the door to the stairs to their level. Yes, defense was close enough, and my inelegant, draft-horse build was far better suited to it. But like some horribly cursed item in a Stephen King story, every time I skated past the blue paint, I could hear it whispering to me. Challenging me. Daring me. Reminding me how extremely cool all the gear is. I’m sure at least half of what it said was outright lies, but let’s face it, there’s no arguing with that last one. Welcome, ladies and gents, to my quest to become a beer league Legend. Heaven knows what’s going to happen here. But she who has the best story when she dies wins, and I’m here to be a contender. 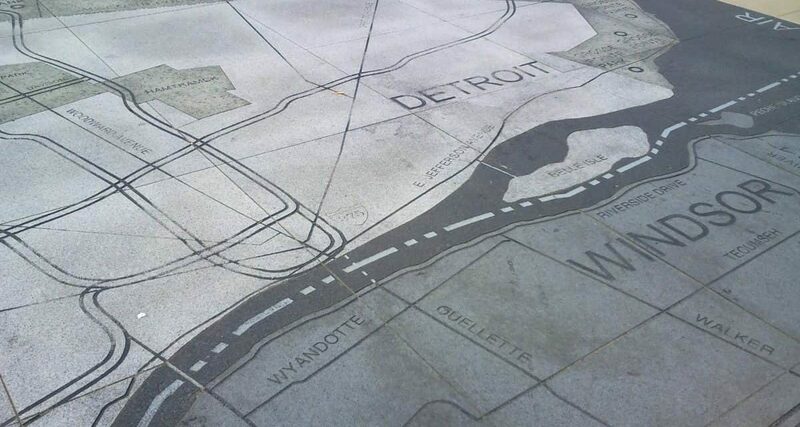 Sorry folks: there IS no “south Detroit”. Screw you, Journey. You’re gonna be great!! Welcome to the fold!! Exactly. I was sad I had to stop rain b4 because this post was over! I’m stoked to read part 2. This is inspiring AF. Your greatest gifts are coming to the surface. You are doing what most would be terrified to even dream about. SEIZE YOUR GREATNESS AND FULFILL YOUR GOALS. LET US ALL BEAR WITNESS!! Great piece! Looking forward to Part Two! I’m so pleased to read this! It’ll be awesome! I’m 59, hip replacement, still play, still take lessons, It’s the best position in the best sport with the best people. She’s right. Nobody around here liked Roy. Can’t wait to read the next part. Maybe I’ll see you at the rink! I played out until 14 and continued with tennis. 52 years later after retirement I returned to hockey as a goalie at 66. 69 now and starting my 4th season as self taught using internet videos and Ingoal articles. Aches/pains/training is supplemented with TENS/EMS. Rapid Response Goalie Training program from Maia Mountain is the advancing age cat’s meow. I just do the stick time, pickup, practice penguin level. Cancer, diabetes, cardiovascular, osteoarthritis, hypertension, and hyperlipidemia keep me under control at 2 goalie days each week. Oh to be 40 again. You go girl! I started playing goal at 33, four years ago. You already have the most important thing: The NEED to be between the pipes. 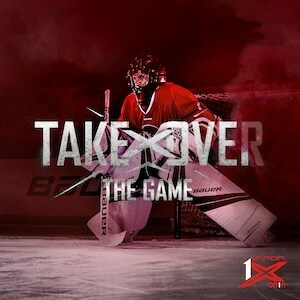 Stay square to the puck, protect your 5-hole with your stick, and be fearless. You’re going to own that crease. This is going to be so good! I’m excited for you! Wow, good luck Jackie. I look forward to hearing/reading about your adventures. Hey! Just wanted to say I had this article open and hadn’t read it for awhile, finally dkd and just realized I met you at the Pure Hockey Reopening! Chest protecter section haha feel free to be in touch Im always happy to help out a fellow goalie. Get it, girl! I have a similar story. My husband is a lifelong goalie who played college and beyond. When we first started dating I couldn’t even track the puck on the tv during a game; it was all so confusing and…fast. Flash forward several years and three daughters later, my husband presented me with an opportunity he refused to let me pass up. Our daughters’ hockey organization was looking for a few good “Moms” to participate in a Mom’s skate at our annual winter carnival. Up until then, each year that they had been doing this game it was an hour of comedy that resembled herding cats. Hardly anyone knew how to skate, never mind stop, and they always brought in some mite goalies for the ladies to shoot on. This year, however, would be different. My husband encouraged me to contact the coach ASAP and ask to be the goalie. “Goalie?” he asked, “Are you sure?” and I said absolutely. He said they had never had a mom be a goalie but that he thought it was a great idea. And so, at the age of 38, I carried some of my husband’s old gear into the locker room for the first time, put my pads on the wrong legs because I was so anxious to get out there, and the rest is history. I fell in love! I have zero interest in skating out. I like my net, and I love the game. The pressure of making a big save… learning from the best goalie coach I could ask for (my hubby!) and the lifelong friendships I have made are just some of the benefits of this decision. And now, not only do I play with my original team, I have also formed a more competitive team complete with the best players from my original team and some others, most with extensive past hockey experience. I like to push myself to play with and against the best, and I can’t learn enough. I can’t wait to read the rest of your story!